The public displays of affection between the powerful pair included cheek smooching, hand-holding and even a delicate dandruff dust-off. Call it the "Art of the Feel." 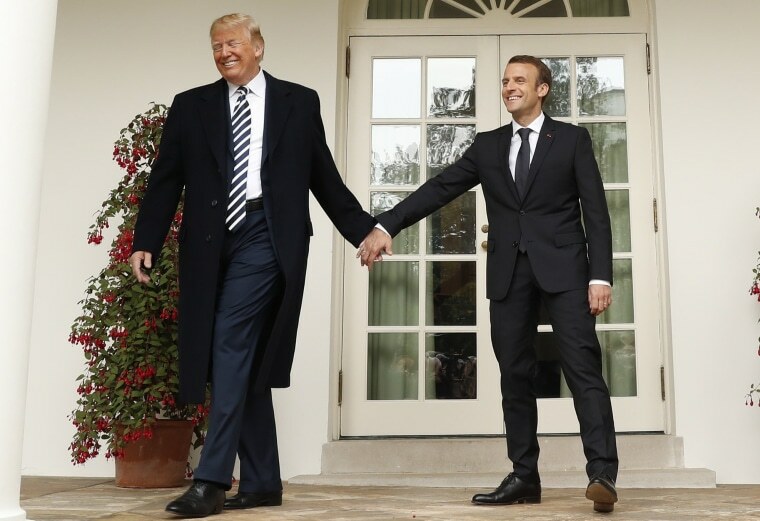 President Donald Trump and his French counterpart Emmanuel Macron put their warm bromance on full public display Tuesday, engaging in frequent PDAs at the White House that revealed how friendly they have grown since a tense meeting last spring. Trump's tenderness Tuesday first revealed itself during an arrival ceremony for Macron, when the powerful pair performed a double cheek kiss — a typical European greeting custom. Moments later, during the ceremony, the two smooched again and carried on a long handshake that clocked in around five seconds. Later Tuesday, during a brief appearance by the two leaders in front of reporters, the American president gently wiped something — Trump said it was dandruff — off Macron's shoulder. "We need to make him perfect. He is perfect," Trump said after his delicate dandruff dust-off. Moments earlier, Trump noted the media is "always saying what a great relationship we have." "It is not fake news," the president said of his connection with Macron, whose visit made him the first foreign leader to be welcomed at the Trump White House for an official state visit. Later in the day, the two awkwardly held hands for a prolonged moment as they walked down the West Wing colonnade to their joint press conference at the White House. And during the press conference, the two shared yet another warm embrace. As the two men stepped away from their podiums, Macron put his right hand on Trump's back, amiably squeezing and patting his counterpart's right shoulder. The public affection indicates the two men have come a long way since their encounter last May, on the sidelines of a NATO summit in Brussels, when they engaged in a long, white-knuckled handshake. Macron made more headlines later that day when he swerved away from Trump and instead hugged German Chancellor Angela Merkel first.